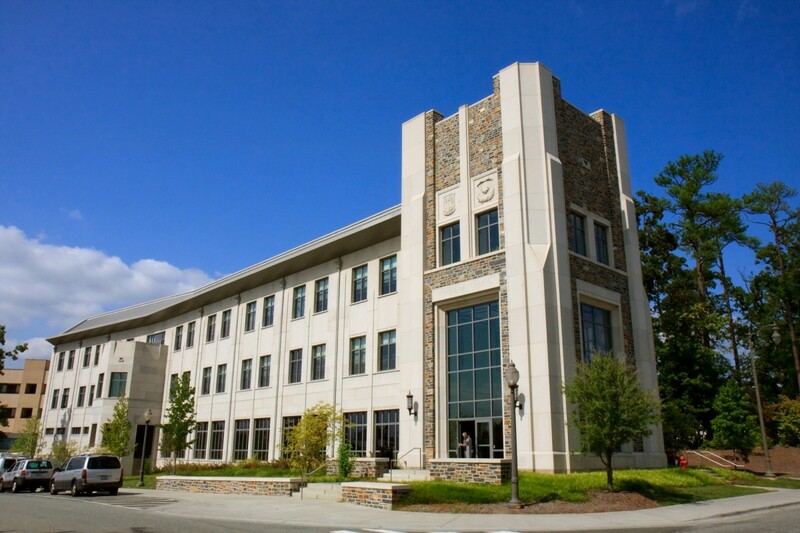 Prominently located on Trent Drive near Duke Clinic and Duke Hospital, the new, three-story School of Nursing is Duke’s second building to be certified for Leadership in Energy and Environmental Design (LEED®) by the US Green Building Council. In fact, the building earned Silver LEED® certification. With nearly 60,000 square feet of space, Phase I of the facility houses classrooms, labs, administrative spaces and an auditorium for the School of Nursing. Phase II includes a new, four-story 15,500-square-foot addition, which houses the distance learning program and research facilities. The main atrium in the building is a three-story space constructed of wood glue laminated columns and beams with a unique curtain wall system constructed with wood mullions. Civil design work included an off-site sanitary sewer extension, underground pipe storage for stormwater rate control, and hydrodynamic separator units for stormwater quality treatment, as needed for LEED® certification. The project also included water main extension and erosion control.